"You'd see them marching through Tytherington from Heytesbury Station. They didn't have their uniforms yet, and you could tell what they had been - the fishermen in their jerseys, and the clerks in their stiff collars". Both sides of the Norton Road from Leys Lane were trenches, and troops would live in them for a week at a time with food being brought out as would occur in war. The impact of all these troops on village life was enormous, and both sides realised they had to get onto together. Village women took in soldiers' laundry, and several snack shops and tea huts were built for the mutual benefit of both parties. · Two village pubs - The Wool Pack and The Bell. · The YMCA in Greenhill House (now Sutton Veny House). · 3 Cinemas (Dymocks Lane, and two Army cinemas in Five Ash lane and in the quarry near the junction of Five Ash Lane and the Deverill Road). "The quarry one came to an untimely end. It was managed by a couple. Mrs was 14 stone plus. Mr - eleven stone minus. One evening the projector broke down and Mrs ordered Mr to take the money and disappear. Being an obedient husband he did so and she told the troops she could not find him, so she was unable to return their money but would give them a free ticket. This was no good as some of the lads were off to France next day. When she persisted, they set fire to the place ...... the troops dragged the piano outside and sang songs ending with 'Keep the Home Fires Burning'. They then threw the piano on the fire and departed". In September 1915 the Division started to leave for France. A camp at Coopers Bottom (Gd 898427) was used for prisoners of war which started to arrive circa 1916. Also in that year a hospital camp opened for 11 officers and 1261 soldiers between Bishopstrow and Sutton Veny, and in December that year No 1 Australian Command Depot moved to Sutton Veny where it remained until 1919. After the Armistice, No 1 Australian General Hospital was transferred to Sutton Veny where it remained until the end of 1919. There were also some Australians in Codford with the New Zealand contingent, and there are the graves of 31 Australians in the Codford St Mary New Churchyard. The Australians cut a reproduction of their badge out of the chalk on the hillside above Foxhole Bottom alongside the A36 which can still be seen today. "Situated in the midst of the largest Australian Imperial Force training and convalescent depots in Great Britain, this mansion, containing over 50 rooms and with spacious lawns and grounds, offers ideal possibilities for rest and recuperation for war weary troops. The Home and grounds are now in the possession of the of the Australian YMCA and present a homelike aspect to Officers, NCOs and men respectively"
In late 1918 and 1919 Spanish influenza was particularly virulent and many Australians and prisoners of war died. The names of 142 Australians and 2 sisters are recorded in the Australian Chapel in St John's Church and are interred in the churchyard. 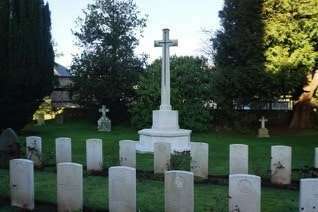 (The names are reproduced here) This part of the graveyard has been classed an Australian War Cemetery. In 1919 the village began to return to normal. The Australians formed an agricultural training depot at Sutton Veny in order to prepare and train their soldiers for returning to civilian life. By mid 1919, 2000 Australian soldiers had been trained. At the end of that year the Australians returned home, the huts were demolished, the Camp railway lifted, and the peace and tranquillity of village life returned. They were not to know that there would be a Second World War 21 years later. There is a yearly memorial service held on the Sunday closest to the Anzac Day (25 April) in St John's Church, Sutton Veny.